The budget is “unsustainable and unimaginative” and there are “lost opportunities for positive returns in renewable energy and encouraging a shift to electric or hybrid private vehicles,” Greenrock said. The environmental group said, “From a Greenrock perspective there’s very little to comment on regarding Budget 2017 – at least on the basis of the Budget Statement. The devil being in the detail, however, there may be something more to say after the Budget Book is made available. 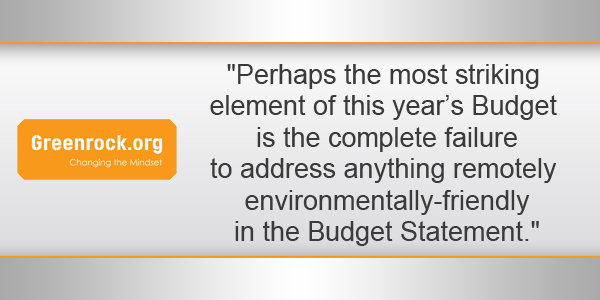 “Perhaps the most striking element of this year’s Budget is the complete failure to address anything remotely environmentally-friendly in the Budget Statement. There is no mention of sustainable development, energy efficiency, renewable energy, waste management, marine sustainability, green jobs or even climate change. “The Budget Statement makes references to various threats to Bermuda and the economy, citing for example the impact of Brexit, the ‘Trump effect’, a ‘tax haven threat’ and global financial regulation initiatives. “Surprisingly the Budget Statement is silent on the threat posed to Bermuda and the economy from global climate change [and the impacts of global climate action] – all the more surprising when a survey of 750 experts at the World Economic Forum in 2016 cited climate change as the single greatest potential threat to the global economy. “We have known since 2008 the likely negative impacts of global climate change on Bermuda’s existing infrastructure, electricity supply and demand, freshwater resources, tourism, public health, agriculture, fisheries and ecosystems. “Despite this, we have yet to take serious action to address these issues. Every year that passes without a climate action plan, policies or budget actions to address these concerns is another year lost that brings us closer to potential environmental, economic and social collapse. “While the Budget Statement, in discussing the exchange value of oil, does note that ‘the era of super cheap energy may be over’ and the implications of this for Bermuda’s energy bill, there is no clear Budget focus on developing renewable energy here in Bermuda – a development which would both reduce Bermuda’s energy bill [by reducing the need to import fuels] and keep hard currency within the Bermuda economy rather than leaking it overseas. “And while Tourism does get a mention, it is disappointing that, with 2017 being the International Year of Sustainable Tourism, there doesn’t appear to be any budgetary support for sustainable tourism initiatives. “While we do welcome the slight increases to the Ministry of Environment [a 3% increase to Planning; 2% increase to Parks; and 2% increase for Environment & Natural Resources], until we see the more detailed Budget Book it is difficult to understand what this means in real terms. “We note the 5% decrease to the Department of Energy – we assume this is due to the increased role of the Regulatory Authority taking over aspects previously internal to Energy – however it’s not clear from the Budget Statement what the budget allocation for the Regulatory Authority is. “We also still have questions about the role of sustainable development in the Government, with the Department of Sustainable Development having previously been merged with what was the Central Policy Unit. It is also unclear whether the Sustainable Development Round Table – which was set up to serve as an independent watchdog on sustainable development for the Government – is functioning. “We would like to see more accountability in government spending and recommend that all ministerial budgets be directly linked to, and measured against, key performance indicators. “We do welcome the increases to the Ministry of Education – especially the commitment [as we understand it] to invest in the physical infrastructure of the schools. Nevertheless, it’s not clear to us whether this investment will also include smart investments in reducing the carbon footprint of schools. “Investing in this would reduce the overall long-term costs to the public purse over time, through investments in energy efficiency and renewable energy. Similarly, this could be expanded throughout all government owned buildings – smart investments to increase energy efficiency and even add renewable energy infrastructure to these buildings, could considerably reduce the overall long-term costs to the taxpayer, while at the same time reducing Bermuda’s carbon footprint. “We are hopeful that the 13% increase to Public Transport will, however, boost public transport use – key to reducing our overall carbon footprint. “The budget is, ultimately, unsustainable and unimaginative. There are lost opportunities for positive returns in renewable energy and encouraging a shift to electric or hybrid private vehicles. While the proposals regarding tax reform are of interest, we are disappointed at the lack of ‘green taxes’ such as a carbon tax. “We would hope that the Government would investigate the potential for innovative fiscal instruments to encourage a more sustainable Bermuda. “We believe that fiscal instruments are potentially among the most effective – and cost-effective – options for making Bermuda more sustainable – and note the success that Mauritius has had in reforming its tax system to promote environmental objectives. Greenrock – we are broke – get over it. Now I know why I stopped donating to them. I think it would be unrealistic for a group like Greenrock to be all “yeah we cool” if the items that they’re interested in, weren’t addressed. It is what it is. To transition to renewable energy, you don’t need money, you need legislation! IDIOT! Liberal groups will always want liberal spending on what they consider to be socially beneficial matters. People who adopt Margaret Thatcher’s “butcher shop” budget theory will usually disagree with such liberal groups. Being liberal has nothing to do with being sustainable! If you create legislation and incentivise individuals, corporations and utilities to become more sustainable, sustainability will arrive in Bermuda. If you continue to ignore the obvious problems the entire planet is facing, you won’t get anything accomplished. Very sad day that the government won’t even try to make headway towards the goals set forth in the 2011 Bermuda Energy White Paper that we, the people, spent money creating!!! All for nothing! If you think your electricity bill will go down anytime in the near future, get ready. Last one holding the oil can is going to be the biggest loser.